The first Independence Day movie was 20 years ago and like many young movie-goers, I was too young to know what a movie was, let alone alien films. So when critics started bombarding about the usage of original cast, I was like… how many current active movie-goers actually got to watch ID4 in 1996? So many Singaporeans actually went to catch Independence Day: Resurgence movie just to see how Singapore was destroyed by aliens and spaceship. That two seconds of national pride was… subtle and dark. I wouldn’t have noticed that it was Singapore until my friend pointed out Marina Bay Sands to me. But I had to admit. I love the special effects. To get this thumbs-up from me is not exactly easy because the skeptical side of me will always try to spot the CGI loopholes. The Earth Space Defense (ESD) unit and the ESD hybrid fighter planes might seem a little over-the-top, but I can’t deny they were pretty cool and spectacular. If you treat this film as a Sci-fi show and nothing else, you will most likely enjoy it. The characters were not developed properly. There wasn’t much to root for. The main young characters, Jake Morrison (Liam Hemsworth) and Dylan Dubrow-Hiller (Jessie Usher) seem to be more rash than strategic half the time and depending on luck that they are surviving. Jake’s sidekick, Charlie Miller (Travis Tope) was so “inexperienced” that I was half-waiting for him to die suddenly in the hands of the aliens. The sudden inclusion of a bunch of kids survived the alien collision and escaping from the destruction made me wonder if I had accidentally dozed off earlier without knowing. The silly twists with Julius Levinson (Judd Hirsch), scientist David Levinson’s (Jeff Goldblum) somewhat wonky dad escaping a tsunami and driving a school bus into the middle of a desert land used to corner the alien queen was entertaining yet ridiculous at the same time. Cheesey-ness aside, it was nice to see another Asian celebrity, Angelababy as Rain to be featured as a pilot alongside with the main leads. Although her role was played down by quite a bit, it was still more significant than Fan Bing Bing in X-Men: Days of the Future Past and Li Bing Bing in Transformers: Age of Extinction. Oh ya, if you understand mandarin, you might be able to catch some interesting Chinese conversation between Rain and her Uncle Jiang Lao (Chin Han). China accent versus Singapore Chinese accent. Are you able to differentiate? Go catch it (with some popcorn) and enjoy the grand scale of destruction which you won’t hope to see in real life. Will Smith was supposed to reprise the role of Captain Steven Hiller, but Fox refused to meet his request for a $50 million salary for two sequels. When interviewed with BBC, Will Smith said it was a scheduling clash with another movie (Suicide Squad 2016) which led to Smith not being in the picture. His character Captain Steve Hiller (Colonel Hiller by 2007) died during a test flight of one of the new Alien-infused Earth Space Defence fighter jets. His son, Dylan Dubrow (played by Jessie T. Usher) will carry on his legacy. Bill Pullman’s daughter, played by Mae Whitman in Independence Day (1996) was recast to Maika Monroe andfans expressed dismay over the decision across the social media. The speculation being that producers believed Whitman was not “conventionally pretty” enough to reprise her role. Whitman has remained mostly silent on the matter. Seven actors reprise their roles from the original Independence Day (1996). They are: Jeff Goldblum (David Levinson), Judd Hirsch (Julius Levinson), Bill Pullman (President Thomas J. Whitmore), Brent Spiner (Dr. Brackish Okun), Vivica A. Fox (Jasmine Dubrow-Hiller), John Storey (Dr. Isaacs), and Robert Loggia (General Grey) in a cameo. The making of the movie had to shut down for about four days due to financing problems where the production ran out of money according to an interview with star Liam Hemsworth. Singaporean actor Chin Han acted as Jiang Lao, the ESD Moon Base Commander, uncle to Rain (Angelababy) conversed in Mandarin with Angelababy. The inclusion of Chinese was believed to be able to boost the box office in China. 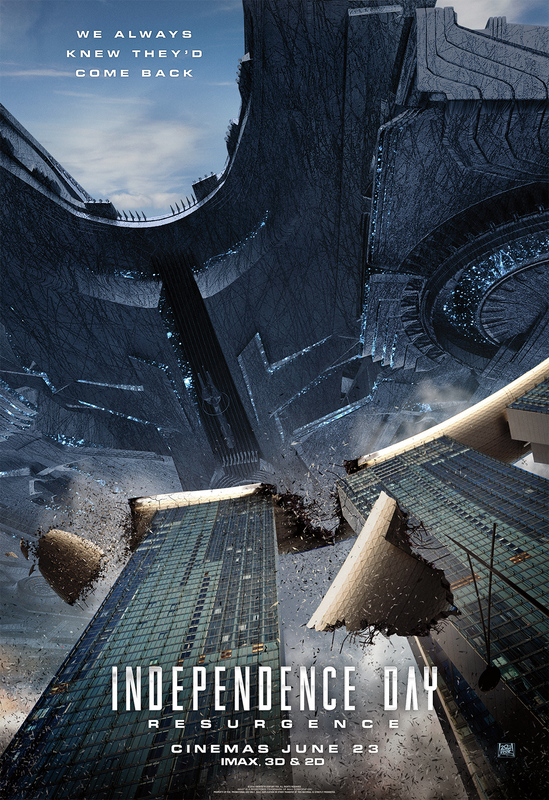 Check out Independence Day: Resurgence Official Website and Facebook Page! Independence Day: Resurgence is out in cinemas on 23 June 2016. I am in love with the movie. I see no fault in the scenes, actions, the acting and drama. I love the fact that Liam Hemsworth was featured in this film. The diversified cast also made it worth my while. It is a pity that Will Smith couldn’t feature in this movie, he missed an opportunity. I haven’t watch this show.. So tempted to watch it after reading your review.. Looks like it’s a great movie! What a blow to Whitman who is lovely! I have heard mixed reviews. Not sure if we’ll see it or not. I loved the first one. I don’t know why people at least one section of them is panning the movie! I liked it. Probably because I never watched the first part. Planning to watch it next week. I don’t have much hopes though… Its all the same story line of late. America saving world from aliens!!!!!! You know I did not like this too much, especially when compared to the first one. Anyway, it was good to see an Asian beauty like Angelababy in a Hollywood film, but why did she have to flip her hair like a model after she alighted from her plane? I have seen this movie and to be frank, there’s lots to be desired in connection with the story line. Nevertheless, the actors seems to play their part to the max. I think everyone around me would have seen this movie and got mixed review about it. I am still waiting to watch it soon. Whoa, lots of interesting trivia in this post. It’s hard to believe that such huge production would run out of finances. This movie is a must-watch not only because of the plot but also because of the actors starring in it. I think the sequel was done years apart from the original movie that it felt like a new movie instead of a sequel. I guess it’s reintroducing the threat to a different generation. I haven’t had the chance to see the movie, but I was a little disappointed about Will Smith declining because of the salary issue. Lol. The first one was awesome. I’ve heard really bad reviews about this one though.